More than 20,000 species of mushroom-forming fungi exist on the planet, but we barely appreciate their important roles and intricate evolutionary history. In our latest article we examine global patterns of mushroom evolution and find that the Jurassic was an eventful period for them. You may have already noticed the myriad of fruiting bodies of fungi while walking in the woods, and wondered how much morphological diversity of mushrooms exist beyond what you usually see in the local store. And indeed, thousands of species grow fruiting bodies with a variety of shapes (Figure 1), but our knowledge is scarce about their evolution. That is the reason why we attempted in our latest article to get a broad evolutionary view of the class Agaricomycetes, the mushroom-forming fungi. 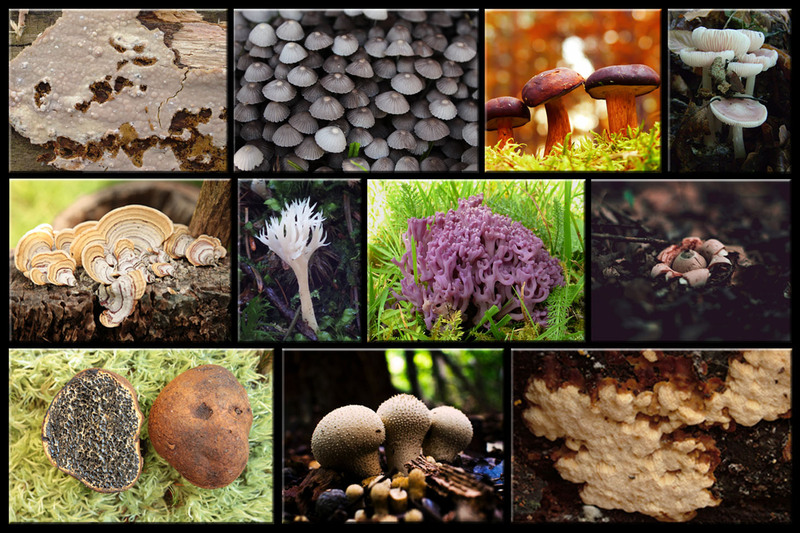 Figure 1: Morphological diversity of mushrooms in nature. The flattened, crust like morphologies, called resupinate mushrooms (upper left and lower right) were the ancient types from which many, more complex morphologies, such as bracket fungi, puffballs, earth stars, corals and the well-known ‘mushroom’ shapes, called pileate-stipitate morphologies evolved convergently. Photo credit: Zsolt Merényi, László G. Nagy, Torda Varga and unsplash.com: Emanuel Rodriguez, Krzysztof Niewolny, Margaret Weir, Timothy Dykes, J. S. Romeo. The foundation of the work was a phylogenetic tree containing >5000 species of mushroom-forming fungi from all over the world. Generating sequence data for such a tree was the main aim of the ADiv(Agaricales Diversification) project coordinated by László G. Nagy, which was an international effort of several specialist taxonomists and phylogeneticists. Because such big phylogenetic trees are hard to estimate, a phylogenomic backbone was created using whole genomes of 103 species to precisely reconstruct the higher-level relationship of taxa. The Joint Genome Institute’s staff and fungal genome database were, as always, of great help in this part. For me, participation in the ADiv started as a side project when I joined the Fungal Genomics and Evolution lab (Biological Research Centre, Szeged, Hungary) as a PhD student three years ago, but later it became my main project. Molecular clock dating of big trees is also analytically challenging, which couldn’t be accomplished without the help of Gergely Szöllősi (ELTE-MTA Evolutionary Genomics Research Group), who found that a two-stage Bayesian strategy would perform best on our data. The idea was to combine a slow but accurate approach on a subsampled dataset and a fast but approximate approach on the whole dataset. This gave us what we believe are the most accurate molecular clock estimates to date for Agaricomycetes, and a chronogram we could use to analyse diversification rates across the class. We found that the diversification rate of mushroom-forming fungi increased abruptly in the Jurassic period and this was accompanied by some important morphological innovations. Based on our ancestral state reconstruction analysis only crust-like, flattened, so called resupinate, fruiting bodies existed at the beginning of Jurassic (Figure 1), and the emergence of more complex morphologies started in the middle of this period. Moreover, we found that lineages with cap and stipe, in other words with pileate-stipitate morphology, have higher diversification rates than lineages with other morphologies and that gains of the pileate-stipitate morphology were more frequent than its losses. Additionally, this ‘Jurassic boom’ of mushroom diversification coincided with a warming of the climate and the spread of conifers in the Jurassic. Because most of the mushrooms live in association with plants, as saprotrophs, parasites or mutualistic symbionts the spread of conifers could have triggered fungal speciation by providing new and plentiful ecological opportunities. These data, along with those from other analyses (see the paper), collectively suggest that many of the modern mushroom clades and morphologies appeared during the Jurassic period. Yet, our knowledge on the evolution of mushrooms is still far from clear. Therefore, I hope that in the future more and more projects will focus on resolving the evolution of fungi and the results will eventually prompt Hollywood directors to make dinosaurs roar not only among Jurassic plants but among Jurassic mushrooms too.